For years now, we have come to the happy conclusion that no two women have the same body type – and we can breathe a sigh of relief not having to conform to one specific measurement for all brides across the board. Women have been able to embrace their differences in curves, and that now goes double for the wedding day. Your wedding dress should be the one garment that you refuse to compromise on in terms of fit and style – it should be something you truly feel comfortable and beautiful in. For the sole reason that each bride will have a different body type and want to highlight and flatter different parts of her silhouette, we have constructed a little wedding dress breakdown to help you out. Generally speaking, there are six basic style silhouettes that each bride will fall under. While you may not be specifically confined to one single category, many women will have attributes from multiple body types and find it stressful trying to place herself under one heading. You don’t have to. This is a very general guideline of standard body types and the type of wedding dresses that complement them. The best thing to do here is calculate which body type has most of your own attributes, as chances are it won’t have them all. We're also going to explain which styles will both highlight and hide certain parts of the body, so that if you’re still unsure about your body shape you can merely make your decision on what you like best about yourself. You can then decide which style wedding dress you want based on your own self confidence and reassurance – rather than determining the dress via weighing scales and measuring tapes. This body type is seen as a more athletic frame, with slim hips and shoulders and long legs. Usually, women with this body type are taller than most, with less curves like that of a smaller bust or narrow hips. If you find yourself lacking in curves around the hips or bust, then don’t feel like you have to hide your silhouette under ruffles of tulle and taffeta to compensate for lack of volume. However, a classic yet subtle A-line frame will give you the illusion of curves, with a flowing skirt and enhanced waistline. So too will an accentuated neckline, such as a cowl neck or a sweetheart strapless bust. Both these wedding dress accents will fit around your frame comfortably, enough to enhance the areas they sit on such as your hips and bust. Alternatively, however, this is your chance to wear a daringly designed dress if you so choose. 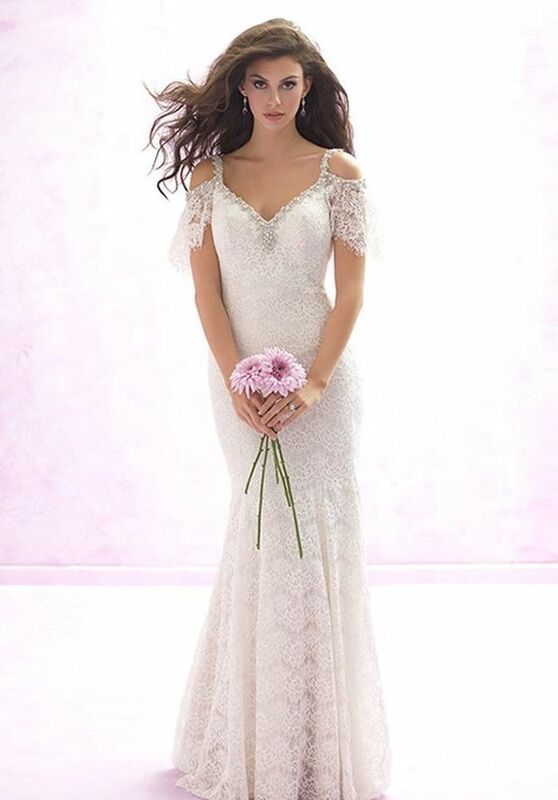 Due to the naturally slim and lean looking frame that comes with this body type, you can afford to pick a dress that is fully adorned in either lace or embroidery, as your frame will able to hold such detail without being overly dramatic. This is your chance to use and flatter your body type rather than hide it away. This is the type of body shape where women will have a very full, curvy silhouette both on top and on bottom and have a smaller waist. They will have wide hips, a full bust and usually due to the two upper and bottom halves being large she will have a smaller waist. These body types are considered rather voluptuous, with women having full figures and dipping curves. 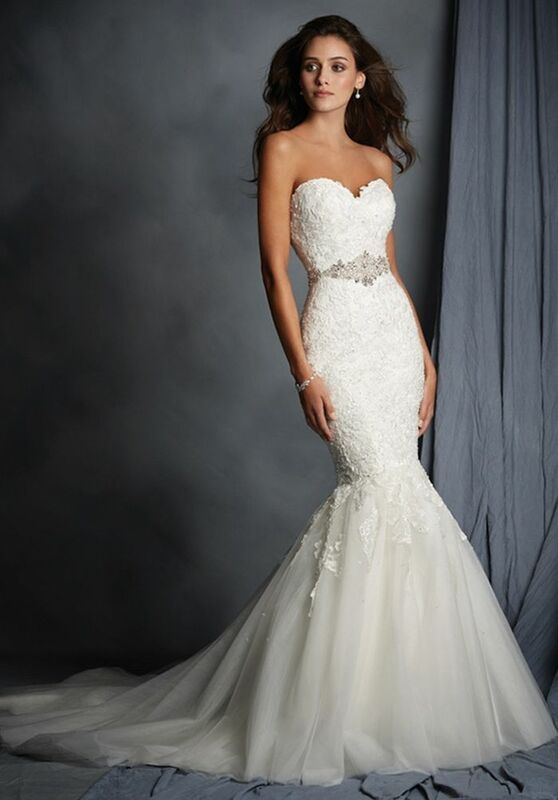 The ideal wedding dress for women with an hourglass figure will be either a mermaid or trumpet skirt gown. 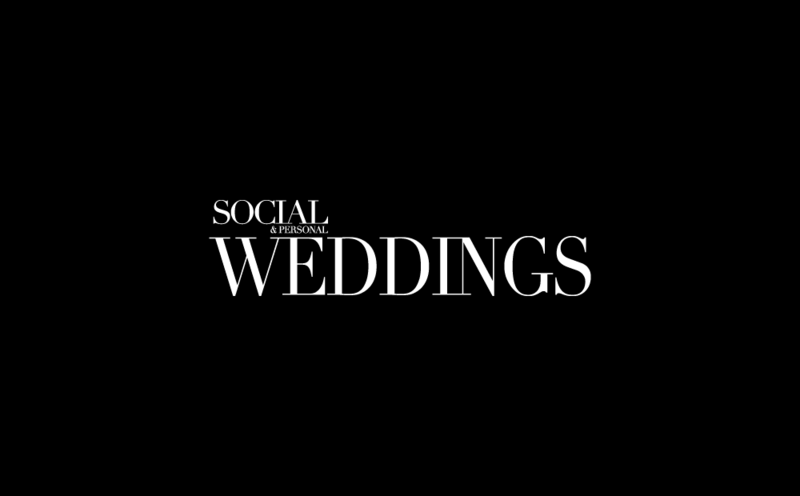 These wedding dresses are the go-to gowns with it comes to showing off what you have, and they are hugely popular at the moment. They flatter and accentuate the bust while their main focus is on the hips, before the end of the skirt erupts out in ruffles of tulle. 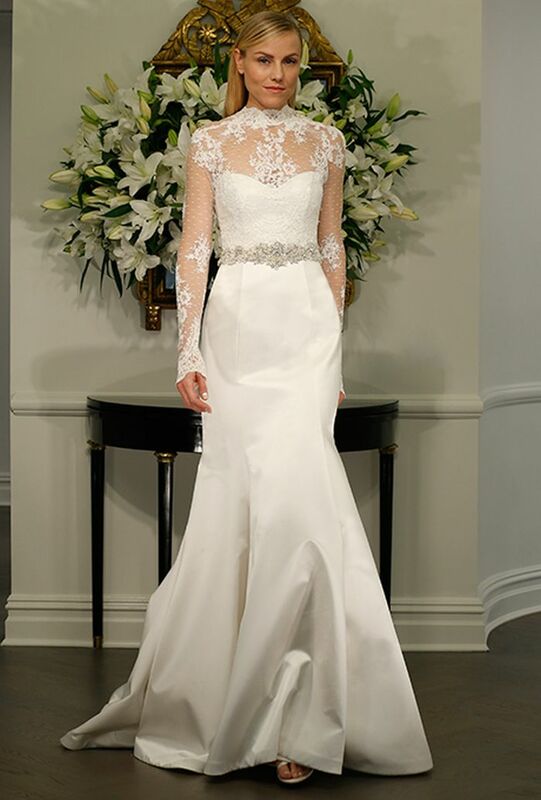 They enhance the curves while drawing in a tight, figure-hugging shape and add further drama to the end of the dress with a voluminous skirt. These dresses are full of volume and emphasis, for a woman who wants to show off all that she has. For those who want an even further sense of grandeur and allurement, they can opt for the fishtail skirt, which is exactly that of a mermaid or trumpet but with an elongated slightly cathedral trail flowing outward at the base. Typically, this body shape is often referred to as the “apple” because the silhouette is heavier on top with a large bust and holds more volume than the lower half. Women who fit under the apple shape category will usually have most of their weight up top. The perfect type of wedding dresses for these body types are those with accentuated waistlines and of course, the ever-reliable A-line gown. The emphasis placed on the lower half of the silhouette with an A-line flowing skirt will create a balance on top, giving you an overall flattering and even silhouette. Alternatively, of course, you may not want your bust to be displayed on your wedding day. 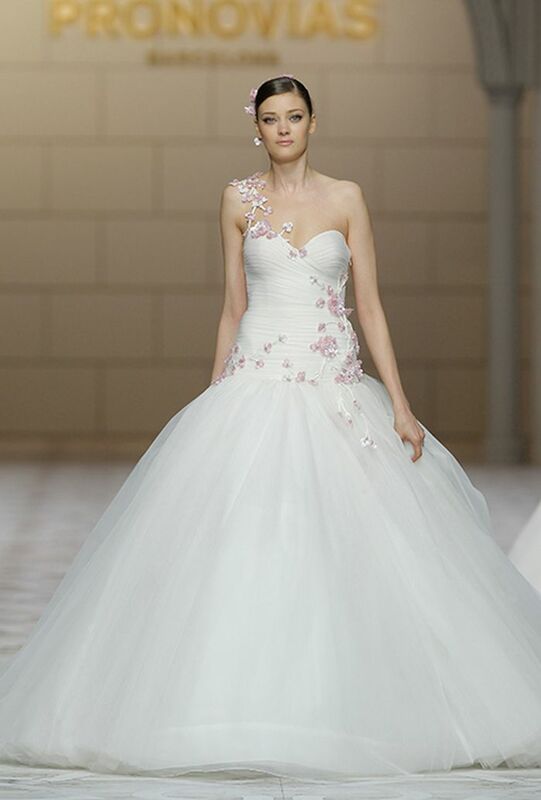 There are many different wedding dress options to suit those tastes, such as a high neckline. If you are choosing to cover your upper half fully, you will still need to take into account the priority of balance in your silhouette. A covered bust can often look twice as big and noticeable if it is not done properly. In order to create that much-needed symmetry for your upper half, pair a high neck with long sleeves. That way, the sleeves will create a balance with your upper half and flatter your silhouette in a dress that you feel secure and beautiful in. With the same principles behind this body type as that of the apple, the pear shape holds most of it volume on the hips or legs, with a narrow waist and wide hips. The perfect dress type for girls with a pear shape will be the asymmetrical types. 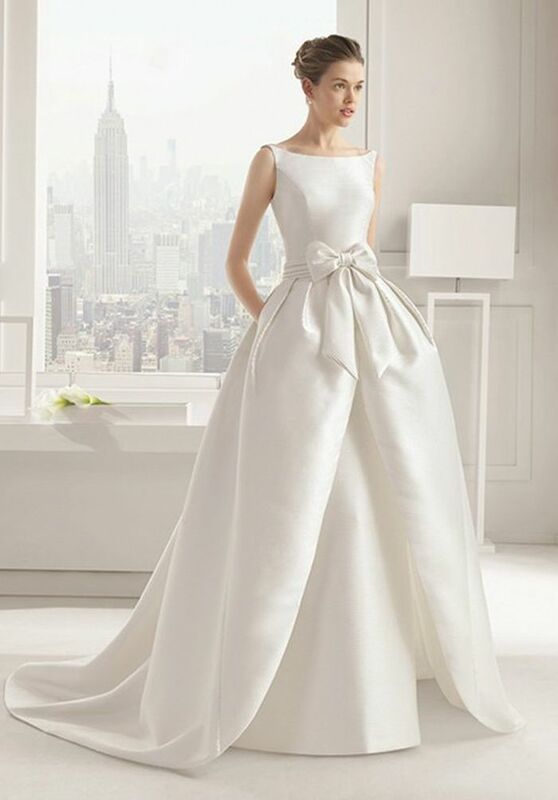 An asymmetrical dress is a wedding dress that will have more emphasis and shape on one part than the other, like a draped waist or a ruffled skirt. These typically have either a trailing ruffled layer skirt that cascades diagonally down the dress, or a one-shoulder strap bodice. These type of structural dimensions on a wedding dress create the illusion of proportional balance. Similarly, if you don’t like the idea of an organza gown with ruffles, you don't have to go for the large silhouette. There are also options for you to choose a slimmer, straighter outline on your dress while keeping a flattering and comfortable figure. A dress with detailed neckline and bodice will flatter your upper half, while an ethereal flowing column skirt will flatter your hips perfectly without drawing attention to the shape or size. Usually, women with petite frames are those who are shorter than average in height and will have quite a narrow and small body shape. The best form flattering wedding dresses for women with a smaller frame are those that boast illusion necklines and sheathed light fabric gowns that will billow, flattering around your frame rather than overcrowd it. In the case of smaller brides, it’s always a matter of the simpler the better. Anything with a simple, structured lining will enhance and flatter your frame, without overwhelming it. An empire waistline would be perfect, by bringing the eye to rest just below your bust, making your legs appear longer. However, you don’t have to go slim and straight because we said so. If your heart is set on walking down the aisle in that flowing ball gown, then there are certainly styles you can find to flatter a smaller frame. Those with an elongated waist line usually go against smaller girls, but if it's paired with a detailed neckline and a wide flowing skirt, then the balance between the length of the waist and the volume both on the skirt and across the bust will fit your frame perfectly. These are the usual body types where women will have that extra bit of curves on their body, such as a full bust, full hips and be slightly more filled out in the middle than that of either the apple or the pear. This is the body type for full, rounded curvy women. A structured bodice here will always give the illusion of sleekness and control for anyone worried about their midriffs. Similarly, an A-line dress will add balance to those with a wider frame. A halter neck or scoop neckline will add definition and shape to your shoulders whilst flattering and enhancing the bust, and also pulling in the upper half of the bodice to define the waist. Don’t be tempted to hide your shape on your day or be afraid to show off what you have. Try going for something that will both flatter your shape and at the same time have you feeling relaxed and secure. We just love plenty of shoulder details and dramatic waists when it comes to women with curves, and don't be afraid to go for a column sheath silhouette as long as it has plenty of detail up top. Remember, anything you feel great in will make you look even better on the outside, so focus on finding the perfect dress that will keep a smile on your face all day long. 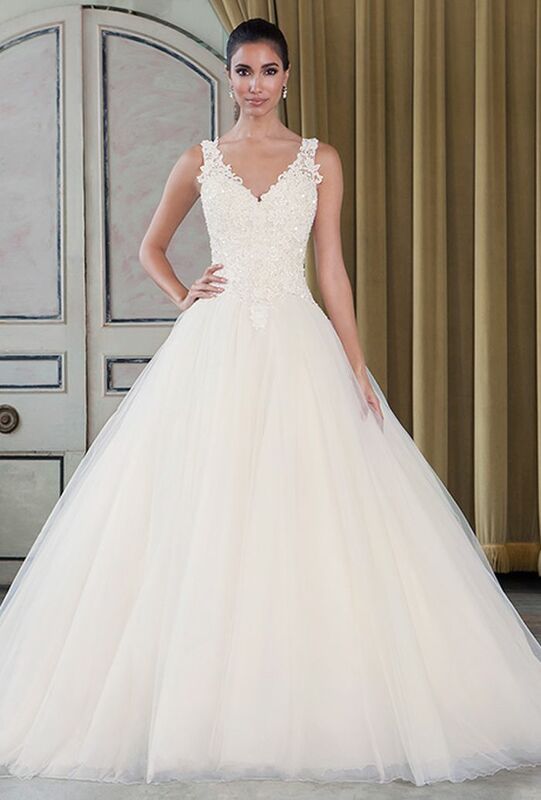 If you're looking for inspiration for your dream dress, make sure you check out our dress gallery.